Let’s face it, wedding planning and throwing your wedding reception does not come cheap. These days with the rise of living costs, inflation, and GST most hotels and wedding venues have increased their rates per person or per table. Are weddings a good investment? Financially, maybe not. Many couples find themselves pressured to throw an extravagant wedding reception in the hope of keeping up with the Joneses’, but in reality, may find themselves trying to recuperate their finances after the wedding is over. 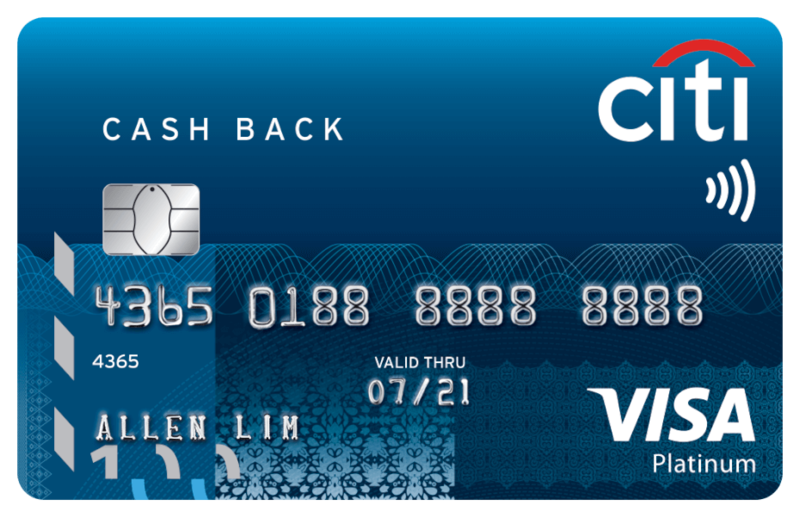 Some couples throw all their life savings into the wedding, rack up credit card debt, and withdraw a personal loan to have the wedding of their dreams. Don’t get us wrong though, a personal loan is a great financial tool to fund your wedding if you can afford the repayment over the tenure period. Have a dry dinner with alcohol-free drinks. If your reception must absolutely have alcohol, consider keeping it to a limited bar with a few options such as beer and wine only. Instead of a full-blown dinner, consider throwing a brunch or tea-time reception instead. Is a ballroom full of guests you barely even know really your dream wedding? How about an intimate dinner reception with your closest family and friends instead? That reduces your headcount drastically and you’ll have a better time! We’ve also done some research of our own, and here are the top wedding venues in KL with packages on a budget. Duchess offers two packages – a wedding reception package and a solemnization ceremony package – both with catering and 2 x food tasting. 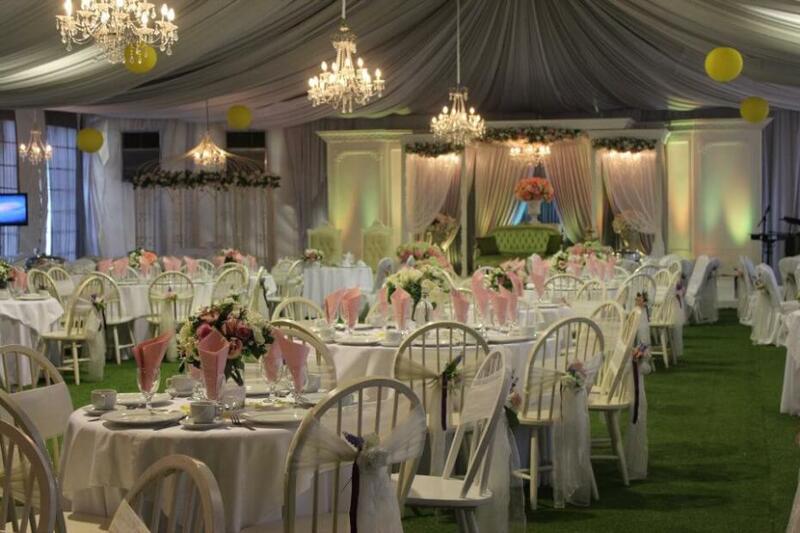 The venue is actually a bungalow and it can be leased out for your special day. Food and décor arrangements will be handled by Duchess Weddings so that’s one less thing to worry about! We recommend taking a look at all their venues before deciding, and review past weddings they have done so you can get a feel of the setup and décor that you would want. Price range: RM30 – RM60 per person. All-inclusive packages are available. 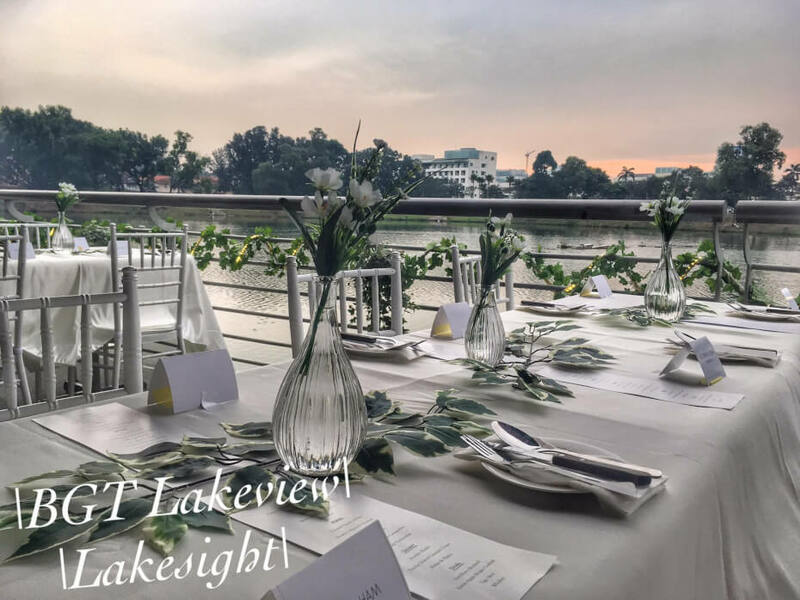 If you’re looking for a venue that provides an affordable all-inclusive package, Lakesight is a good bet. Packages include planning services, furniture, venue rental, decorations, entertainment and sound equipment, invitation cards. You can also add-on custom services including emcee, live band, makeup artist and hairstylist, photographer, and much more. Packages start from RM3,888. We suggest contacting the venue to make a prior appointment for venue viewing. This little cottage is located in Puchong and exudes a traditional English-style home. 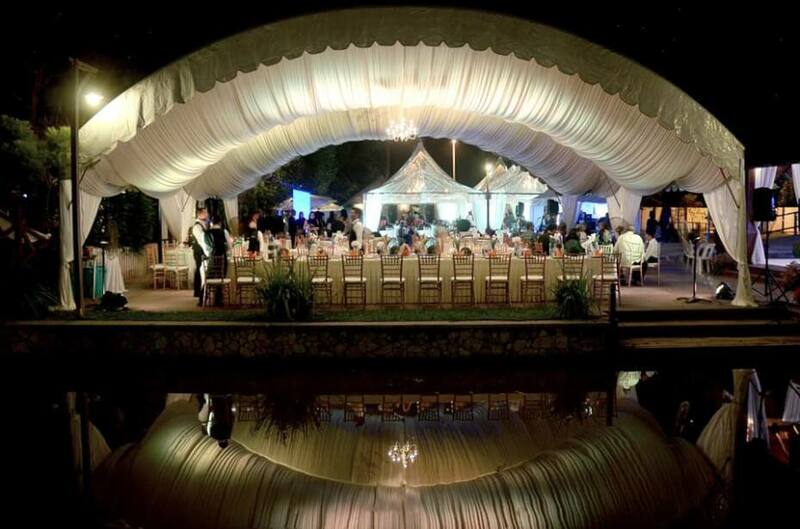 It overlooks a small lake and has an accompanying lawn which is a beautiful backdrop for all your wedding photos. Being a smaller venue, you can look forward to a more intimate gathering, and if you take their day packages, it fares a cheaper price. The package also includes food, pelamin/backdrop, decorations, basic audio and cooling systems and even parking space. There are three tiers of packages available: Silver, Gold, Platinum – each with their own price and offerings. The higher the tier, the more expensive the package (obviously). If you’re a lover of nature, this could be an ideal location for you. It is a 10-acre tropical garden and you have the option of hosting your guests at the restaurant and an open/floating deck outdoors. The cuisine offered is both Western or Asian and you can have it served as a buffet style lunch or a sit-down dinner. Bear in mind that seating capacity differs based on seating or standing arrangements. This is such a steal! All packages include canopy, chairs, tables, meja beradab, fresh flowers, wedding cake, lighting, audio system & music gazebo, emcee, RELA personnel, food & beverages, changing room for bride & groom, and surau. Outsourced catering is not allowed so you would need to pick from their available menu options. 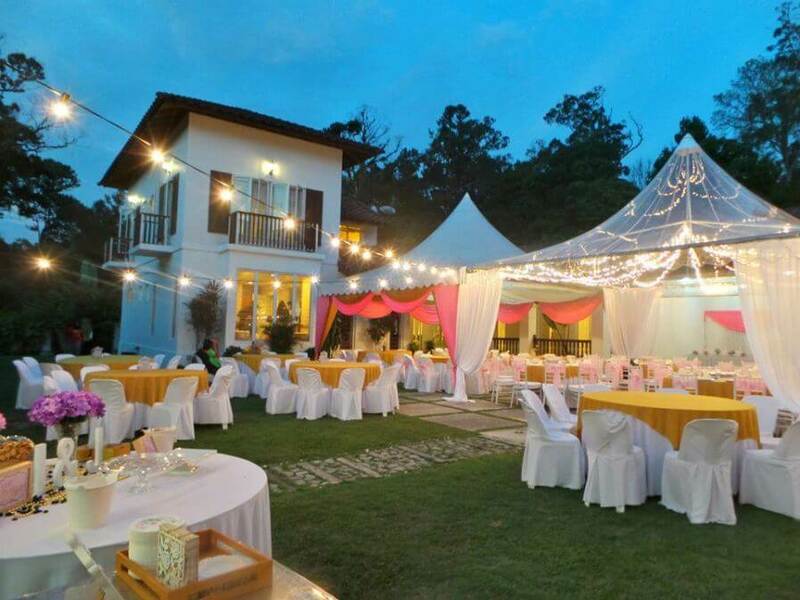 This venue offers a traditional Malay setting and it is a great option for an outdoor garden wedding. 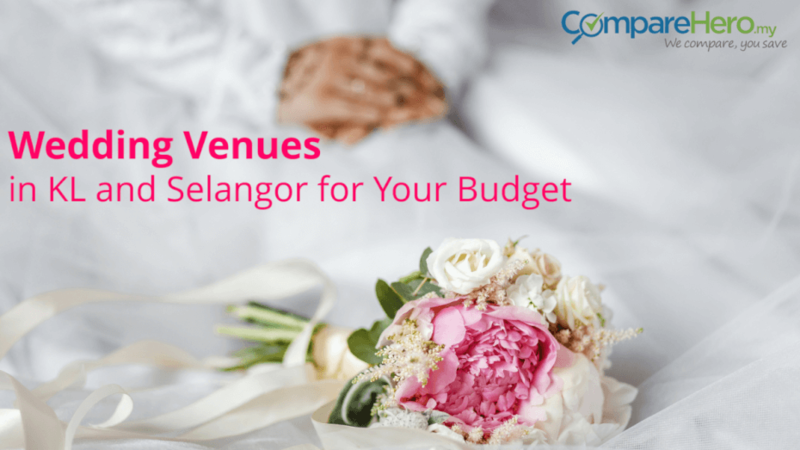 You can dress it up in fairy lights at night to create a very romantic look and feel and with all the offerings in the package, we think this is one of the best value-for-money venues you can find in Selangor! 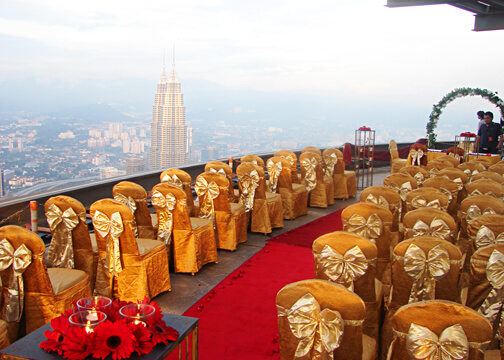 Wouldn’t you want to hold your wedding in one of KL’s iconic towers? You would think it would cost you a fortune but KL Tower offers three different packages to give you a special day and it starts from as low as RM39 per person. You can choose the Open Deck or the Mega View Banquet Hall for a breath-taking view. This package offers buffet menus for guests, dome menus for a bridal table with three additional menus. Free food testing session for ten pax upon confirmation, fresh flowers on the bridal table, entrance arch and red carpet. 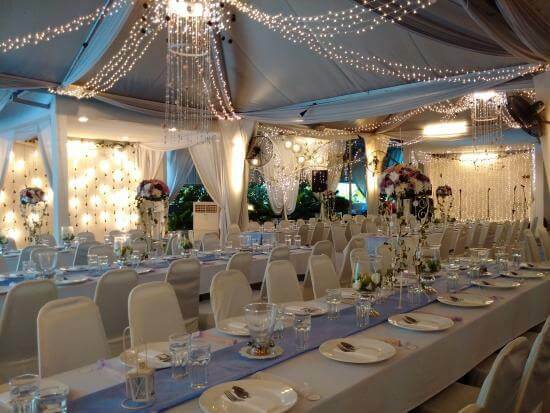 Optional seat covers and tablecloths thematically, dressing room for the bride and groom, usage of audio and visual equipment to complement your event and also a photography session at KL Tower Open Deck for the newlyweds. This is the oldest Italian restaurant in Malaysia which overlooks a beautiful backdrop of greenery and a golf course. They also have a small outdoor deck, so if you’re interested in an outdoor wedding, this venue can accommodate to your wishes. The venue will be able to propose the right seating style for your number of guests and whether you would wish for it to be held indoor, outdoor, or both. Basic entertainment includes background music and a PA system but for more, you would need to hire your own third-party service provider. 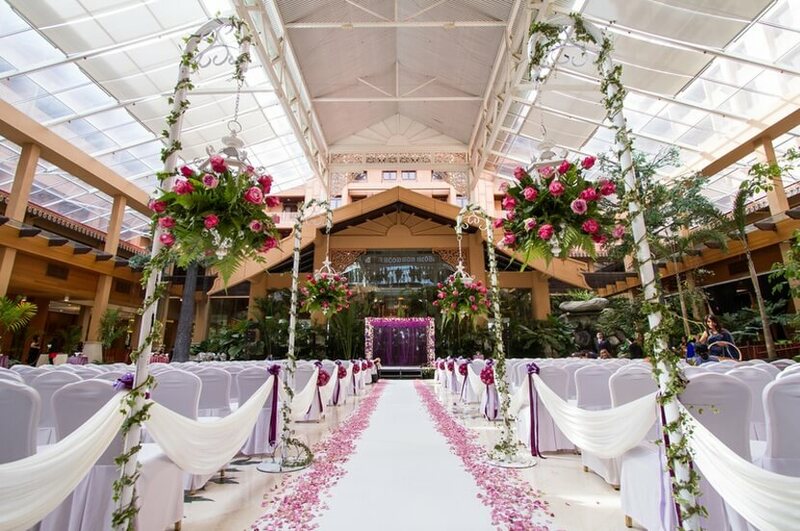 Check out the indoor garden venue at the Royale Chulan Hotel if you want to host an outdoor wedding with the added security of a roof in case it rains. The hotel caters to all types of weddings, so if you’re looking for an 8-course Chinese dinner to a Malay buffet spread, you got it! 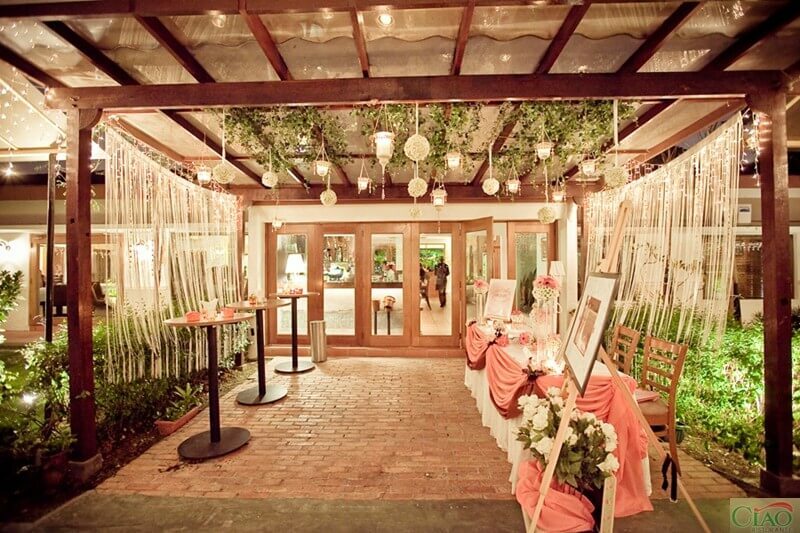 This is double storey bungalow right on Jalan Yap Kwan Seng and offers a beautiful venue for weddings and private events. It comes with an open garden area, an indoor seating hall, and a balcony. Their Standard Package includes an Asian and International Fusion Buffet Package which includes dining décor, fresh flower bouquet for each table, exclusive use of the venue from 6 pm to midnight or 9 am to 3 pm. If you’re looking for a personal loan to fund your dream wedding, look no further. Our free comparison tool can help you find the best low-interest personal loan to help you say your vows and marry your significant other.